Barna Karimi, Afghanistan’s new ambassador to Canada, has a varied background which most recently included two key jobs in Afghanistan — first working as President Hamid Karzai’s deputy chief of staff (2005-2007) and then working for him as a deputy minister (2007-2011). But he comes with corporate and cultural distinctions, too. For four years (2001-2005), he was president of Alma USA Enterprise Inc. (a wholesale company) in Los Angeles and for four years before that, was general manager of Triton Inc. (a shoe company). He has a master’s degree in business and yet he has published one book of his own poetry and another of Japanese poems he translated to Persian from English. He joined Diplomat’s editor, Jennifer Campbell, to discuss his plans in Canada. Diplomat magazine: You’ve restructured the embassy since you arrived. Can you explain your approach? Barna Karimi: I divided the whole embassy into five sections. No. 1 is diplomatic and government relations — this can go both ways, with Canadian issues and Afghan issues. No. 2 is economic and development relations. This includes CIDA, the ministry of mining and commerce in Afghanistan and the private sector relationship here. We’ve already started talking about a Foreign Investment Protection Agreement between Afghanistan and Canada and we’re talking about a mining symposium in Toronto. No. 3 is public outreach and community relations. This means reaching out to Afghan Canadian citizens and to Canadian citizens. With Canadians, my priority is to make sure I call on some of the families who lost people in Afghanistan to convey a message of condolence and my appreciation for the loss they bore in Afghanistan. I want to tell them how grateful we are for the assistance the Canadian people provided to Afghanistan and how much better our lives are for those losses, both in resources and also in quality of life. This is a priority. And, of course, I want to reach out to the academic community, the universities, and to start a relationship with universities in Afghanistan. I will work on culture issues, exchanges we can have in terms of exhibitions or literary work. No. 4 is media relations. No. 5, the last one, is the administrative and finance issues that every corporation has [a jocular reference to his business background.] This is a new embassy. I have a good team around me. DM: You’ve recently taken up your new position as ambassador to Canada. Did you bring family with you? BK: Yes. I have a wife, Storai Karimi, and I have a two-year-old daughter, Maral. She will attend daycare and I’m in inclined to send her to a French daycare because she’ll learn English anyway. She is a U.S. citizen so she may eventually live there. I want her to take a gift from Canada when she leaves, so maybe that will be [an ability to speak] French. My wife will go to college. She goes to the gym four times a week so she’ll be busy. 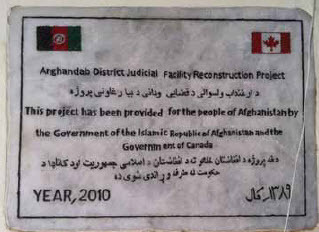 This is the plaque an Afghan man showed Mr. Karimi before he came to Canada. It’s mounted on a courthouse Canadians helped build in Kandahar. I have published two books. One was a collection of poems I wrote and published in 2003 in Los Angeles. In English, the title is Story Tellers of Fire in Acacia. It’s [written] in Persian. My second book, Blossom Will Go to Heaven, is a translation of Japanese poems. I translated them from English to Persian. I’ve also translated or written more than 100 articles on Afghanistan, Persian literature and philosophy. DM: Your country has negotiated a 10-year security partnership with the U.S., which obviously signals a long-term commitment by our neighbour. Can you tell us in some detail what this agreement provides? BK: The first section is on general understandings within the agreement. The second is on the [legal] status of the partnership and on the Afghan constitution. The third is on support for the Afghan national security forces. It’s a commitment that [the United States] will support Afghan forces. The last section is on the development of economic growth in Afghanistan, on good governance and anti-corruption. This is the structure of the strategic partnership. [The agreement] is in the final stages so I can’t comment on details. By signing this strategic partnership, I’m very hopeful we’ll have a much clearer framework of partnership between Afghanistan and the United States. As you know, we’re signing a lot of strategic partnerships. We’re hopeful we’ll sign one with Canada. These strategic partnerships will bind us to certain commitments that both parties make in terms of improving the lives of citizens in Afghanistan, whether through governance and developmental assistance or assistance for security. And assistance when it’s needed. Unfortunately, Afghanistan’s geographic location makes us vulnerable. The [U.S.] strategic partnership will help assure us that [assistance] will be there when it’s needed. Also, this partnership will bring us closer to Afghan sovereignty, or full sovereignty, because right after this, there will be more talks on how the international security assistance forces will conduct operations in Afghanistan. We already have an agreement on Afghan control of detention centres. This will make us more responsible and give us more authority. Those two things come hand in hand. DM: What would you like NATO’s role to be, beyond 2014? BK: We want support, both financial and technical. Long-term support is needed to make sure we secure Afghanistan, bring civility and defend it against terrorism. The world put a big price on Afghanistan’s security. They spent a lot of money and lost a lot of lives. After losing the lives, and after putting a lot of money and resources on the ground, I don’t think the objective was to leave Afghanistan without any plan of how it will stand on its own two feet. If NATO just leaves, Afghanistan could turn back to the way it was before 2001. In terms of having assurances that Afghanistan won’t fall back into a land where terrorists can create camps and one day attack Western countries, I think it’s better to have a programmatic approach to what happens after 2014. A long-term commitment is profitable for the West and for Afghanistan. In a way, I think it will help the Afghan government to stand on its own but it will also give peace of mind to Western countries that Afghanistan won’t become a land where terrorists can plan attacks against NATO countries. We want our NATO allies to support us but this support should not be at a cost of sovereignty for Afghanistan. We should take full responsibility and take the lead — with the support of our international friends. We gave these countries assurances we will defend, secure and stabilize [our country]. DM: You talked about how much Western countries have spent, both in terms of dollars and lives. How much longer can you expect this to continue? BK: I was in Washington in February when one of our ministers of mines presented a roadmap for mining in Afghanistan to members of a think-tank. This roadmap was a good alternative to donor fatigue in Afghanistan. If everything goes according to the plan, in 2023, Afghanistan will have a little more than $500 billion in revenues from the mining sector alone. Now I think, if we synchronize our efforts with those of the international community, that we will have a deadline for [the time] when Afghanistan will be fully self-sufficient. I’m not saying that one day we won’t need anything from the world but at least we’ll be self-sufficient in our resources. DM: How would you describe the security situation in Afghanistan currently? BK: It’s improving. What you see in the media is totally different from on-the-ground. Instead of holding territories, the insurgents are just using IEDs and suicide attacks. This means they don’t have freedom of movement anymore. Last time I travelled in Kandahar, about two months ago, I drove to four districts with the governor — I actually drove there. That means security has improved rapidly. I couldn’t even drive freely around the city of Kandahar a year-and-a-half ago. We are making a lot of gains in terms of security. In terms of stability, we now have the local police program, the district delivery program. This is stabilizing areas. We have freedom of movement between some of the villages and we have revived the government services in many districts. That means it’s much better. In Afghanistan, we don’t need security; we need stability. Stability comes when you have governance actually take over the securing of perimeters. We’re making sure we have more presence of government. Before the military operation in Panjwai, we had only two employees there — the district governor and the chief of police. Now we have more than 50. That brings stability. The security situation is better. Of course, incidents happen and we all saw that in the last incident in Kabul [in April] the Afghan security forces did a great job. DM: So you feel there’s real progress? BK: Yes. If they have the right equipment and training, they’ll do just as well as the international forces. But we don’t have a lot of technical capabilities and training and we appreciate what the Canadian government is doing to support Afghan police with this training. DM: Which Canadian soldiers’ families will you visit? How will you decide? BK: I’m going through the right channels. I want to make sure they’re comfortable with meeting. I respect the privacy of some of these families who probably don’t want to see me. Whoever wants to see me, I’m here to make sure I pay my respects. DM: You are a former employee of Hamid Karzai and therefore must know him well. BK: I was his deputy chief of staff and deputy minister. I worked with him very closely in the last six years. Probably one of the reasons he sent me here is because he knows how important this mission is. He wanted to put his trust in a person like me to make sure I do a good job. DM: How confident are you in his leadership? BK: I’m very confident and I know him personally. He doesn’t compromise on the sovereignty of Afghanistan; he doesn’t compromise on the lives of Afghan civilians. He doesn’t compromise on national territory, on our values. For that, I have a great respect for him. He’s been a great leader and he’s done a lot for that country. Everybody has the right to criticize and there are things that might not look right in our eyes that do look right in his eyes. But that doesn’t mean he’s not thinking about Afghanistan. These four things [on which] he doesn’t compromise make him a good leader. That’s what Afghanistan needs. DM: How important is Canada to Afghanistan? BK: It’s very important that we have Canada as a friend. One day [Canada’s economic assistance] will drop to zero but we know we have a friend on this side of the world. That’s Canada. We can count on Canada. To pay back, I’m working very hard to make sure Canadian people benefit from Afghanistan, to make sure the private sector invests and creates jobs for Canadians. This will one day be a two-sided relationship, a profitable partnership one day between the two countries. I’m setting that as an objective right now. DM: What would you tell Prime Minister Stephen Harper? BK: There are a lot of things. It’s not just police trainers. I want a strategic partnership with Canada. I want a foreign investment protection agreement so Canadians can feel comfortable going to Afghanistan. I want support, along with the police trainers, I want counter-IED technical assistance. I want the development assistance of CIDA because, among the donors, CIDA is doing a very good job in my country, particularly on education and environmental issues. I would ask him to sustain the support. We always ask for increases [though we] understand budget restraint and cuts. Assistance is very much appreciated and makes a lot of difference. DM: How do Afghans view Canadians? Be honest. BK: For the last four years, I was in charge of local governments and travelling quite often to Kandahar, where the Canadian soldiers are stationed. At that time, I didn’t think to ask about Canadians specifically because we saw Canadians as NATO forces. But when I was appointed ambassador, I travelled back to Kandahar and I asked people about Canadians. And you know what? They’re really happy about what the Canadians did. In one case, an old man actually took me to the courthouse that was built by Canadians. He showed me a stone [plaque on the building.] He showed me how much he appreciated that courthouse which they wouldn’t have without Canadians. It was very touching. We never had any problems with Canadians in terms sharing information or coordinating projects. We had a lot of problems with other countries but we worked very hard to program Canadian funding in Afghanistan. It was well-programmed. DM: You say you’ve been instructed to improve Afghanistan’s image in Canada, both with the public and the media. How important is this? BK: This is a priority for me. We’re a poor country. We know that. Every time you turn on TV, you see poverty or suicide attacks and the Taliban. I’ve got pictures I printed today. I want to hang them in the embassy — nature photos, pictures of people working, beautiful scenes. That’s the real Afghanistan. We’re not the terrorism capital of the world, or the poverty capital of the world. We have a lot of good things. As a person with a background in culture, I can do a much better job of showing the real Afghanistan. I will call on fellow Afghans in Canada to show that side as well. DM: Has family income increased in the past decade? Has poverty decreased? BK: Tremendously. Life expectancy and quality of life have been upgraded. In terms of government, salaries have tripled in the last 10 years. This should, of course, reduce corruption. But a lot of people also work for international agencies. When [these agencies] leave the country, it will create a dilemma because people’s lifestyle is now set to a higher standard. It might be difficult to attract [people] to Afghan institutions. We will need a strong private sector to employ some of these people.